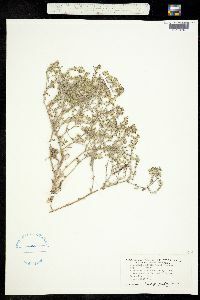 Duration: Annual Nativity: Native Lifeform: Herb General: Herbaceous annual, 15-40 cm tall; stems single or commonly several, erect, paniculately branching, nonereous, antrorsely strigose and sparingly hispid. 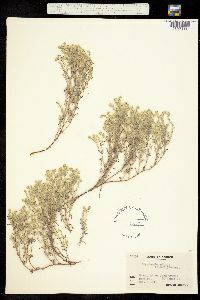 Leaves: Spatulate to spatulate-linear, abundant along the stems before anthesis, to 3 cm long and 5 mm wide; the lower surface strigose, upper surface sparsely hairy or glabrous. Flowers: Inflorescences terminal, dichotomous composed of many cymes; calyx at anthesis about 2 mm, the lobes lanceolate, at maturity 3 mm long, ovoid, eventually deciduous, the lobes converging, hispid; corolla white inconspicuous, 2.5-3 mm long, the lobes broadly obovate. Fruits: Nutlests with tubercles, triangular-ovate, to 1.3 mm long, 0.9 mm wide, homomorphous; gynobase narrowly pyramidal, about equaling the nutlets; style much surpassing the nutlets. Ecology: Dry slopes in volcanic and limestone-derived soils; 3772-7218 ft (1150-2200 m). Distribution: se AZ, s NM, s TX and s to n MEX. Notes: Cryptanthas are notoriously difficult to ID without fruit. This species apparently rare within its range. 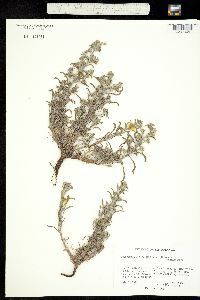 Distinguished by being a 15--40 cm tall annual flowering in the summer as opposed to spring as in most other Cryptantha and the coarsely-warted nutlets of the same shape and size with an obvious triangular attachment scar inbetween. 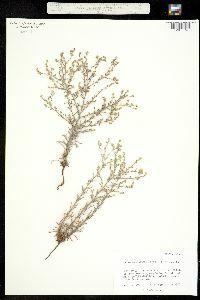 Ethnobotany: unknown Synonyms: Cryptantha argentinica, Cryptantha falcata,Cryptantha ramosa,Krynitzkia ramosa Editor: FS Coburn 2014 Etymology: Cryptantha comes from the Greek krypto, "hidden," and anthos, "flower," a reference to the first described species in the genus which has inconspicuous flowers that self-fertilize without opening; Albida is derived from latin meaning -whitish-.